Williston Walker produced this benchmark biography in 1906: it is till the best. Gripping, enlightening and authoritative - you will learn of a man whose theological stance and political philosophy has done much to shape modern Western culture and continues to influence millions of people in the 21st century." "Martin Luther's father was a miner with ambitions - he wanted to better himself and provide his children with a good education. Martin upset his father's plans by becoming a monk rather than a lawyer, but by the age of 29 he was a Professor of Theology. In addition to his college duties he preached almost every day and visited people on pastoral duties - he kept two secretaries very busy. Luther's father, meanwhile, became a town councillor, the part owner of six mines and two foundries and owned a large house in the main street. What happened to make this son of the upwardly mobile establishment into a revolutionary who nailed 95 Theses onto the church door at Wittenberg, affecting not only the whole of the Christian Church but also breaking the power of a European superstate? This is the story of a passionate, flawed and courageous man who loved his family and the people around him; a man who went further in challenging the status quo than any other in history, the man who started the Reformation." Reformer of the sixteenth century, such an effective preacher during his long pastorate at Saint Pierre Cathedral in Geneva, Switzerland. 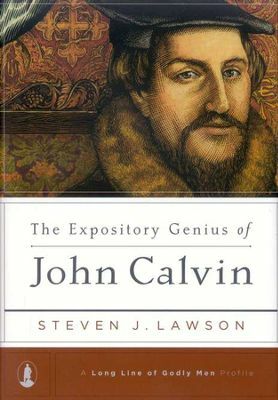 Dr. Lawson identifies thirty-two distinctives of Calvin's preaching, providing comments from Calvin's writings, quotations from Reformation scholars, and examples from Calvin's own sermons to reinforce his points. In the end, Dr. Lawson finds in Calvin a strong model for expository preaching and calls on modern pastors to follow the Reformer's example. Steve Lawson is the senior pastor of Christ Fellowship Baptist Church in Mobile, Alabama. Dr. Lawson serves on the board of directors of The Master's College and on the ministerial board for Reformed Theological Seminary. He teaches with Dr. John MacArthur at the Expositor's Institute. Early in the sixteenth century, legislative decree in England controlled people's access to Scripture and prohibited an English Bible. But theologian and linguist, William Tyndale, was determined to provide his fellow countrymen with Scripture they could read. In The Daring Mission of William Tyndale, the latest addition to the Long Line of Godly Men series, Dr. Steven J. Lawson traces this daring mission, which was ultimately used by God to ignite the English Reformation yet would cost Tyndale his life. From one man's labor, we're reminded of God's faithfulness to preserve His Word and equip His people. England in the seventeenth and early eighteenth centuries was in the midst of spiritual decline, marked by lifeless sermons, strife, persecution, and malaise. Into this dark time, George Whitefield burst forth as one of the greatest preachers the church had seen since the time of the Apostles. Called the "Grand Itinerant" for his unprecedented preaching ministry, Whitefield crossed the Atlantic Ocean numerous times and lit fires of revival on two continents. Yet, as Dr. Steven J. Lawson illustrates in this latest entry in the Long Line of Godly Men Profiles series, we must note that Whitefield was a man whose extraordinary evangelistic fervor was marked by remarkable piety and deep theology, and whose unswerving devotion to his God led him to risk all that he had to preach the name of Christ. During the Protestant Reformation of the sixteenth century, the Reformers' most effective tool was the pulpit, and all of the Reformers were gifted preachers. This was especially true of Martin Luther, the man regarded as the father of the Reformation. Luther used every legitimate means to make known the truths of Scripture. His strategies included writing books, tracts, pamphlets, and letters, as well as classroom lectures, public debates, and heated disputations in churches and universities. But his chief means of producing reform was the pulpit, where he proclaimed the truths of God's Word with great courage. In a day when the church greatly needed to hear the truth, Luther's pulpit became one of the most clarion sounding boards for God's Word this world has ever witnessed. In The Heroic Boldness of Martin Luther, Dr. Steven J. Lawson shows the convictions and practices that fed Luther's pulpit boldness, providing an example for all preachers in a day when truth once more is in decline. Edwards, often remembered for his sermon, "Sinners in the Hands of an Angry God," is revealed here as a man with a heart for God's glory above all things. To help himself pursue that goal, he composed a set of resolutions to guide his conduct in all areas, from his battle against sin to his use of time. In Edward's singleminded pursuit of God, Dr. Lawson sees an unparalleled example for modern Christians. Charles Spurgeon, the great Baptist preacher of nineteenth century London, is remembered today as "the prince of preachers." However, the strength of Spurgeon's ministry went far beyond simple rhetorical skill. With a foundational commitment to the Bible, Spurgeon fearlessly taught the doctrines of grace and tirelessly held forth the free offer of salvation in Jesus Christ. In short, he was a firm believer in the truth of the gospel and the power of the gospel to save. In The Gospel Focus of Charles Spurgeon, new from Reformation Trust Publishing, author Steven J. Lawson explores Spurgeon's fascinating life and ministry, showing how he clung to the gospel in every venue of life and ministry, teaching it constantly even amid controversy and personal suffering.